by Major Francis Jones, TD, MA, FSA. Coat of Arms no 36, October 1958. Fifteen shields of arms occupy a special position in Welsh heraldry. They greet the student of Cymric antiquities at every turn — in armorial rolls, in bardic poetry, in genealogical collections, on buildings, on windows, furniture, bookplates, signet rings and silver plate. Their impressions appear on the brittle wax that dangles from ancient deeds, their colours brighten the windows of the halls and churches in the valleys and the remote slopes of storied Snowdonia. They are the arms of the xv Noble Tribes of North Wales. So well-known were these arms to the writers of bygone days that they often blazoned them merely by using the name of the tribal chieftain to whom these arms had belonged or had been attributed. In the manuscripts, the names of such heraldic ancestors often appear in parenthesis after the names of the descendants, e.g., Owen of Bodeon (Hwfa ap Cynddelw), Glynne of Hawarden (Cilmin Troed-ddu), or, alternately, as short sentences, e.g. ” He bears the arms of Marchudd,” ” he bears Edwin with this difference “, and so on. Since practically all the gentry of North Wales were descended from these fifteen tribal chieftains and bore their arms (usually undifferenced), the constant repetition of the blazons would have taken up a great deal of space in manuscripts, and so the name of the chieftain served as an abbreviation. To the English reader, familiar with other fashions of scribal presentation, this practice may appear bewildering at first sight. Yet it is a most useful and sensible method, for apart from giving the coat-of-arms of a particular individual or family, it has the added advantage of identifying the genealogical group to which that individual or family belonged. It is essential that we should know what arms are represented by the names of these chieftains. Many lists of them occur in Welsh manuscripts and in some printed sources. These are not always readily available to the general reader. No reference to the xv Noble Tribes has been found prior to 1493, although there are early references to most of the chieftains that appear at their head. All the available evidence tends to show that this codification was the work of late fifteenth century genealogists. It is a convenient but artificial list, and there is nothing to suggest that in medieval times these tribes had any historical existence. In this context the significance of the word “tribe” is genealogical, not constitutional or political. The list was not finally determined until the latter half of the sixteenth century, and the same is true of the order of precedence. I shall refer to the chieftains and their arms by their Roman numerals later. The fifteen nobles all came from Gwynedd, that is, the old Principality of Wales, represented today by Anglesey, Caernarvonshire, Merionethshire, Denbighshire and part of Flintshire. Their distribution is as follows: — in Anglesey, I, II, III; in Caernarvonshire IV, V (also in Merioneth), VI, VII and VIII (also in Denbigh); in Denbighshire IX, X, XI, XIV; in Flintshire XII and XIII; and in Merionethshire XV. Three of them, VIII, IX, and XI, are connected with one district (Is and Uwch Dulas in Denbighshire). The periods in which these nobles lived, or are alleged to have lived, are as follows: — between 800 and 900 A.D: IV, VIII, X; between 1000 and 1100: V, XI, XII, XIII, XIV; between 1100 and 1200: I, II, III, VI, VII, IX, XV. Generally speaking, when these dates are tested by genealogical computation from fixed dates in the pedigrees of the descendants of the nobles, the chronological structure is found to harmonize with the traditional dating. Thus, there is nothing extravagant or impossible about the dates attributed to them. Only one of them (see X below) seems to be ” rocking the boat ” a little. A notable feature about the ancestry of these nobles is that, with one exception, they trace back to royal families. The ancestry of some of them is not stable and varies in different manuscripts, but their ultimate royal origin is a constant feature. The ancestry of x, the exception, is traced to a noble. All the others trace back either direct, or via Rhodri Mawr or Cunedda, to Coel Hen Godebog. Only in the case of XIV is the ascent to Coel Hen Godebog made through the distaff side, and it is to be specially noted that it had been considered necessary to do so. Thus, these nobles belong to the Cuneddan or North British tradition, and, historically, this is in complete harmony with the known facts of the Brythonic conquest of Gwynedd in the early fifth century. Perhaps the accuracy of the earlier portions of these pedigrees is not so important as the significance of the claim involved (and it it a constant and fixed claim). Whether claims to such sources were “common form” in the twelfth and thirteenth centuries when they are first found, or whether they were made merely in order to invest new families with greater prestige, are matters for discussion and outside the scope of this essay. There is a possibility, however, that we are in the presence of a more primitive approach to the concept of nobility, and that these claims represent relics of very early times. The names of the nobles are in keeping with the Welsh form of nomenclature which is known to have prevailed in the period in which they lived. Five of them possess “nicknames”, two possess territorial adjuncts, and the remainder have genealogical names (ap = son of). A brief analysis of the arms may now be attempted. Only the seven nobles who lived in the twelfth century can conceivably have borne any sort of arms themselves; the remaining eight lived well before heraldic times and it is manifest that arms were subsequently attributed to them, and, I believe, that this is true of the whole fifteen. Their descendants, living in armorial days, adopted arms, probably arbitrarily as was often the fashion, and either these or the bards then stated that in reality they had been the ensigns of the tribal chieftains whose names shone like suns in splendour in a myriad Cambrian parchments. They are retrospective fictions, but they are also historical arms because they were actually used by descendants in late medieval and post-medieval times. Accordingly, it becomes a matter of supreme importance to determine the date (or approximate date) when they first appear. Number v is the earliest, appearing first in the fourteenth century; I, II, XII, and XV appear in the fifteenth century, and the remainder in the sixteenth century. And so the majority of them emerge at the very time the bardic systemizers were formulating the lists of the noble tribes, and it is difficult to avoid the conclusion that those who decided the one also decided the other. The arms possess a pleasing simplicity of design and arrangement. Clear, direct, distinctive, they were admirable ensigns for the battlefield. Their ” atmosphere ” is thoroughly medieval, and some of them remind us of those non-armorial personal seals, which, as I have shown elsewhere, were in widespread use in thirteenth century Wales. Three of them are canting arms (II, IV, IX), and another three are allusive (IV, VIII, XIII) being based on family legends. There is only one instance of a complicated coat (IV), but there is no doubt at all that in its original form this coat consisted only of the charge now shown on the inescutcheon. Let us glance at the metals and tinctures. The field appears as argent in seven coats, as gules in four, as sable in two, there is one vert and one azure. The charges are as follows: — eight are sable, four are or, another four are argent, one is gules and one is proper. The charges consist of the following: — lions rampant appear in three coats, birds in three, boars’ heads in one, snakes in one, a stag in one, angels in one, a human head in one, a leg in one, fleur de lis in one, crosses in two, and chevrons (two being charged) in five. These arms were borne, mainly in their entirety by descendants, and as the Welsh possessed very little sense of differentiation, it is often impossible (without referring to the genealogies) to learn whether we are dealing with main lines or with cadets, or even, in a number of cases, with female descents. Nevertheless, cadency was not entirely overlooked, and there are some remarkably imaginative examples of its use, such as by the numerous branches of one noble group (not included below) who used thirty-two variations of the primary coat of the heraldic ancestor who appeared at the head of the group pedigree. These tribal arms are by no means mere things of the past. Most of the nobles are represented today in the female line. For instance, our gracious queen, Her Majesty Queen Elizabeth II, is a descendant of Marchudd (VIII). 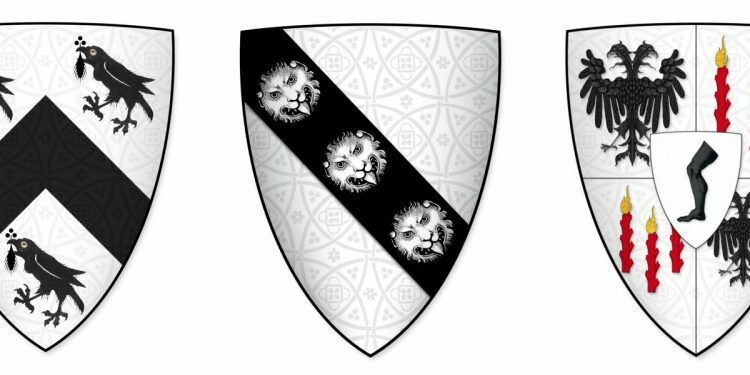 Lord Harlech represents Hwfa ap Cynddelw (I), and the Meyricks of Corchester in Northumberland represent Llywarch ap Bran (II), both in the female lines. There are also examples of unbroken male descent. The Earl of Lisburne, formerly Lord Lieutenant of the county of Cardigan, is a direct descendant of Collwyn ap Tangno (V), and Captain J. Hext Lewes of Llanllyr, the present Lord Lieutenant of that county, is a direct descendant of Ednowain ap Bradwen (XV). Of Anglesey, descended from Cunedda (fl. c. A.D. 400): lived temp. Prince Owen Gwynedd (c. 1100-70): said to have been a steward of that prince. 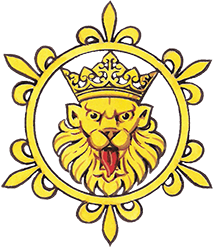 Gules a chevron between three lions rampant or. Of Anglesey: descended from Rhodri Mawr (d. A.D. 878): lived temp. Prince Owen Gwynedd, who was his brother-in-law: said to have been a steward of that prince. His arms are canting (Bran = crow). Argent a chevron sable between three crows proper, each bearing an ermine spot in its bill. III. GWEIRYDD ap RHYS GOCH. Of Anglesey: descended from Cunedda: lived either temp. Owen Gwynedd (1100-70) or of his son, David (1170-1203). Argent on a bend sable three leopards faces of the first. Of Caernarvonshire: descended from Coel Hen Godebog: lived temp Merfyn Frych (d. A.D. 844), and said to be his brother’s son: supreme judge in Gwynedd. Quarterly: 1 and 4, Argent a doubleheaded eagle displayed sable. 2 and 3, Argent three ragged staves fired gules: over all on an escutcheon argent a man’s leg couped a la cuise sable. This coat possesses a canting element, and there is a family legend (three versions have survived) which purports to explain the name and the arms. In its present form the name Troed-ddu means ” black foot “. In 1568 there was a forty-acre farm in Merionethshire called Tir y Kilmin troed dde, which seems to suggest that Cilmin had some association with that county. Several sixteenth century armorials give the arms simply as argent a foot couped above the ankle sable. An English family called Guylemin, later Gilmin, claims to be descended from our nobleman and has actually used his arms: this claim is unfounded. The principal descendants of Cilmin of The Black Foot were the Glynnes of Glyn Llifon and Hawarden. In view of the academic interest which seems to surround Liberalism today, it may be noted that Mr. W. E. Gladstone married a Miss Glynne of Hawarden. Of Merionethshire and Caernarvonshire, said to have lived at Harlech in the former county: descended from Cunedda: lived c. 1000 – c. 1050. Sable a chevron between three fleur de lis argent. VI.NEFYDD HARDD (Nefydd the Handsome). Of Caernarvonshire: descended from Cunedda: lived temp. Owen Gwynedd (1137-1170). Argent a chevron sable between three spear heads of the second, embrued, points upwards. VII. MAELOG CRWM (Maeloc the Bowed). Of Caernarvonshire: descended from Cunedda: lived temp. prince David (1170-1203) ap Owen Gwynedd. Argent on a chevron sable three angels kneeling wings raised, or. Of Caernarvonshire and Denbighshire: descended from Coel Hen Godebog: lived temp. Rhodri Mawr (844-878). Gules a Saracen’s head erased proper (sometimes called a giant’s head). Marchudd was the ancestor of the Tudor dynasty. Of Denbighshire : descended from Rhodri Mawr: lived probably c. 1170 – c. 1195 or thereabouts. The original form of his name was Hedd ap Alunawg. The name Hedd is similar to the word hydd (stag), which suggested the arms. Sable a stag passant argent, attired or. X. BRAINT HIR (Braint the Tall). Of Denbighshire: descended from Rhychwyn the Bearded of Rhos, which is likely; another source states that he was a nephew of King Cadwallon the Blessed (d. 633): lived c. 877 – c. 916. Vert a cross fleury or. Of Denbighshire: descended from Coel Hen Godebog: lived in the eleventh century. Gules a lion rampant argent armed and langued azure. Of Flintshire: son of Gronw ap Einion (d. 984) ap Owen (d. 988) ap Howell Dda (d. 950) ap Cadell ap Rhodri Mawr: his daughter married Prince Gruffydd ap Cynan (1055-1137): lived in eleventh century, said to have been slain in 1073. Argent a cross engrailed fleury sable between four Cornish choughs proper. XIII. EDNOWAIN BENDEW (lit. Ednowain the Fathead or Thickhead, but translated as Strong-head by the charitably-inclined). Of Flintshire, descended from Beli Mawr: lived in the latter half of the eleventh century. His arms allude to one of his exploits — ” He killed a wild boar without help”. Argent a chevron sable between three boars’ heads couped of the second. Of Denbighshire: his male ancestry is unknown; his mother was Gwenllian daughter and heiress of Rhys ap Marchan a lord in Dyffryn Clwyd, who traced to Coel Hen Godebog: Eunydd’s father is said to have been ” a near kindred” to Bleddyn ap Cynfyn King of Gwynedd and Powys (slain 1075) who traced to Beli Mawr: he lived in the latter part of the eleventh century. Eunydd’s paternal arms were Azure a lion rampant or, which he is said to have quartered with those of his mother, Azure a fess or between three nags’ heads erased argent. Of Merionethshire: descended from Coel Hen Godebog: lived c. 1150 – c. 1200: his wife is said to have been Margred daughter of prince Cynan (d. 1173) ap Owen Gwynedd. Gules three snakes nowed in a triangular knot, argent.